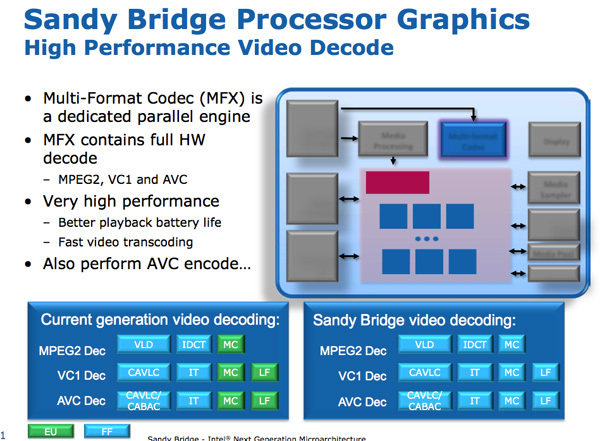 Sitting alongside the GPU is Sandy Bridge’s Media processor. Media processing in SNB is composed of two major components: video decode, and video encode. The hardware accelerated decode engine is improved from the current generation: the entire video pipeline is now decoded via fixed function units. This is contrast to Intel’s current design that uses the EU array for some video decode stages. As a result, Intel claims that SNB processor power is cut in half for HD video playback. 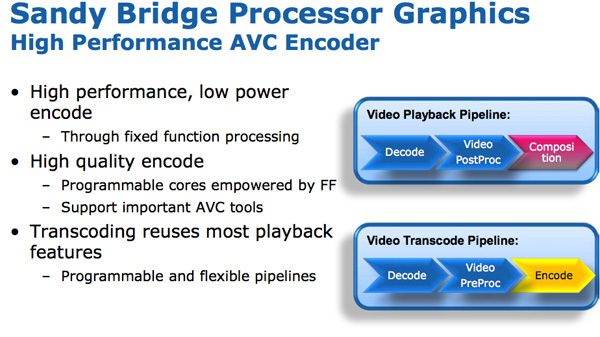 The video encode engine is a brand new addition to Sandy Bridge. Intel is being light on the details of the encoder but we saw a demo where Intel took a ~3 minute 1080p 30Mbps source video and transcoded it to a 640 x 360 iPhone video format. The total process took 14 seconds and completed at a rate of roughly 400 frames per second. Given Intel’s close relationship with many software vendors who work on video transcoding, I wouldn’t be surprised if we saw decent support for SNB’s video encoding engine at launch. At 400 fps we’re well in the realm of high end GPU encoding performance, despite being run on a 3mm^2 piece of the Sandy Bridge die. AMD's been taking about fusion forever but I can't get rid of the feeling that this Intel implementation will be much more "fused" than the AMD one will be. AMD barley has CPU turbo so adding a comined cpu/gpu turbo at once, maybe they can pull it off but experience makes me doubt that very much. first or not, doesn't really matter. who says AMD need's GPU turbo? If Liano really is a 400SP GPU it will knock any Intel GPU with or without turbo. If we see the first results of Anadtech review which seems to be a GT2 part it doesn't have a chance at all. But it's not just about raw power - it's about power per dollar. If you've got $500 to spend on a mobo and CPU, where do you spend it? On a slower Intel platform or on a faster AMD platform? "And i'm sure SB will be faster than anything AMD has." how do you know Intel GPU has reached good enough state (do you have benchmarks to support your hypothesis). they have been trying to reach this state for as long as i can remember. Your all doubts will be cleared after watching this video, and related once. I am having 3 AMDs and 1 Intel, Believe me with the price of AMD CPUs, i can only get a celeron in Intel. Which cannot run NFS SHIFT. Or TIme Shift. But other hand, with AMD athlon, i have completed Devil May Cry 4 with decent speed. And the laptop costs 24K, Toshiba C650, psg xxxxx18 model. It has 360 GB SSD, ATI 4200HD. Can you get such price and performance with Intel?